The Antei Combat Center has been a unique aspect of the Dark Jedi Brotherhood for years. Unlike other clubs, where forums alone are used to tell a story through multiple characters, the ACC is about pitting two (or more) writers against each other in order to competitively tell the story of a conflict between their characters. In Star Wars, nothing is more iconic than the lightsaber duels between characters like Darth Vader and Luke Skywalker, or Darth Maul and Qui-Gon Jinn. What draws us to these battles is not just the technical nature of combat—aggressive styles clashing against defensive styles and so on—but the entertainment value of the combat and the story that is told between these combatants. In the ACC, you will engage in fiction-based combat against another member (or members), taking turns with that member in telling part of the story. Each new entry by a combatant in the match is a post. A standard match will generally consist of four posts—body posts written by both participants one after the other, followed by the final posts, where the battle is ended in a conclusive manner. To begin participating in the ACC, there are several steps you must first complete before becoming a qualified member. Before beginning the ACC Qualification Exam, you must first have a completed, and approved, Character Sheet. If you haven't filled out a character sheet yet, sign in to the Dark Jedi Brotherhood website and create a new sheet in the Character Sheet Administration page before proceeding with this guide. Please refer to the Character Sheet Express Guide for help in completing your character sheet. The Character Sheet is designed to help both you and others write an accurate portrayal of the characters in the Brotherhood. In the ACC, Character Sheets are used as a basis for the characters involved in a fight, and helps both participants and the judges understand the traits and abilities of the combatants. You will make use of the information provided by the sheet as a resource when writing your posts. The various parts of the Character Sheet, and how they are used in the ACC, will be further explained later in this guide. Only ranked members of the ACC may openly challenge other members to matches. To qualify, you must first pass the ACC Qualification course to participate. At this point, you will be free to make use of the Combat Center for personal challenges between yourself and other qualified members of the ACC. You will also be eligible for participation in ACC-based competitions. Please make use of this guide to pass your tests and as a reference guide for actual ACC matches. The Qualification Exam will test your ability to read Character Sheets and to use them in practice when writing a post. Should you pass the exam you will be qualified to participate in the ACC. Do not feel discouraged if you do not qualify on your first try. Many members of the DB have failed to qualify for the ACC in their first attempt. Take to heart what the Judges tell you when grading your exam. On the ACC site, click on Battles. 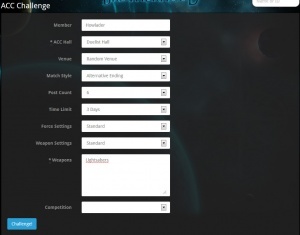 From the drop down menu, you may select either Challenge or Open Challenge. Use Challenge if you already have an opponent in mind, or Open Challenge if you want to be added to a queue where you will be placed with an opponent of similar skill based on what kind of match type you select. We’ll discuss Open Challenge later in this guide. For now, we’ll discuss the options for Challenging an opponent. Select Challenge from the dropdown menu. The website will load a page with the complete options for ACC battles. If you have a particular member you wish to challenge, enter his or her character name into the Member box. The site will auto-complete as you start typing in the name of your opponent. If you do not have an opponent already, consider issuing an Open Challenge instead (See below). Alternate Endings - Each member writes their respective sides of a continuous battle. For the final post, each writer depicts their interpretation of how they think the conflict would end. Singular Endings - The only difference in a Story-match is that there is only one ending for the battle, rather than an alternate ending. One member is charged with the introductory post and their opponent will be charged with the ending post. Matches can be done with a minimum of four posts total to a maximum of twelve, regardless of match type. Remember that in alternate endings, the last two posts (one for each combatant) will be the ending of the battle, whereas in singular it is the very last post that ends the battle. This is how much time will be given between each post. The options are: 24 hours (1 day), 72 hours (3 days), and 168 hours (7 days). Standard - Typical usage of the Force according to Character Sheets and relevant Force power levels. No Force - No usage of Force powers allowed at all. Unleashed - Powers on each combatant's Character Sheet may be used at the level of "Master (+5)", regardless of a character’s Force power level. Powers not on the Sheet cannot be used, including formerly available clan/order powers. Choose the restrictions (or lack thereof) on weapons in your fight. No matter which setting is used, the only weapons available in the fight are those listed in the Loadout box (see below). Standard - Characters may draw from any type of weapon they have equipped on a particular named Loadout. Lightsabers only - Characters may only use lightsabers. The Loadout system is managed through the Possessions interface. You can only use one Loadout at a time in any ACC match, so be sure to have the right one selected when entering a match. While Cybernetics are listed on the Loadout, they function in a purely cosmetic manner that doesn't add protection or benefits to the individual. They are merely visual. Additionally, Droids are available on the Loadout and may be used. The reason Droids are allowed and not Pets, for example, is due to Droids being listed and documented in the Possessions system much like any weapon would be. 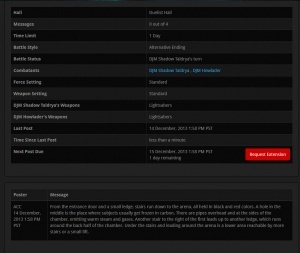 Please note that weapons listed in the match details are the only weapons that can be used in a fight, unless the venue specifies otherwise. 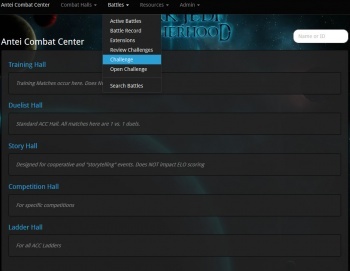 An alternative option available from the Battles drop-down menu, an Open Challenge issues a challenge to all members of roughly your skill level with a set of default parameters. When issuing an Open Challenge, you must choose the match type – either Alternative Endings or Singular, as well as what weapons you will use during the fight, and which competition (if any) the match is for. You may only have a single Open Challenge active at a time, but you may withdraw that challenge at any point from the Review Challenges page under the Battles dropdown menu on the ACC site. Alternative Characters are available through the Non-Player Character system. When equipped with an approved Character Sheet and Loadout, participants can opt to enter into an ACC match using their Alts. This must be selected when a match is created and cannot be changed after the fact. Keep this in mind when planning your matches. Beyond this, if you plan to use an Alt in a manually staff-created match (ie. Tournaments and Brackets) then you must both ensure your Alt adheres to the rules of the event and denote your intent clearly through the sign up forms to ensure the battles are set up with the right character. Writing an ACC post is like writing any piece of fiction for the Brotherhood. There are, however, a few rules associated with the mechanics of an ACC post that will determine whether it is acceptable. Most important of these is the Word Count. In any standard ACC match, one that hasn't had the rules altered for a specific competition, the minimum word count for a post is 250 words. By not meeting that minimum requirement you will automatically lose the match. Before posting, make sure you take a moment to run your post through a program that can do a word count check for you—such as Microsoft Word, Corel WordPerfect, or Google Docs. Because some word counts differ, ensure that you have enough words to create a buffer to pass the minimum requirement. Unless otherwise specified, there is no maximum Word Count for your posts. It is also important to proofread your work before making a post. By taking the time to read over your writing, you will be able to find and eliminate small technical errors that can easily make the difference between winning and losing a match. It helps to make use of the preview button on the ACC site itself to ensure that your post looks the way you want it to before posting. Even the smallest things count when you are being graded against another person's writing. The preview button also lets you check out any formatting elements you may add to your post. By using the Markdown language of the DB site, you can add **bold** or *italics* to your post. Bold can help you to put emphasis on certain words or actions, while italics are good for internal monologues or even telepathic speech. These are all important facets of the mechanics of your post. After creating a match, the ACC site will randomly determine the order in which the participants post in. The first post follows the Venue Introduction—the short introduction to the settings of the battle—and can be used to establish the tone and direction of the match. As the first member to post in the battle, your job is to establish yourself and your opponent in the chosen location and initiate the fight. When deciding how much plot to develop in your first post, you must be aware of the length of the battle itself. In a shorter match—(such as a 4 post Alternative Ending match in which each person writes only 2 posts)—you will need to spend less time establishing the story and invest more time into writing about the fight. With limited posts, it is important to get into the heat of the conflict while you have the chance. 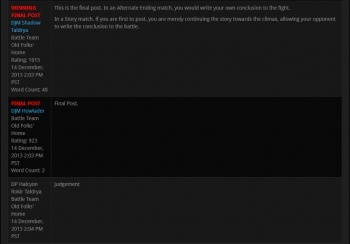 In a 4 post Alternative Ending match, you'll only have a single post to tell your part of the story before writing the final post and conclusion to the match and in a Singular match, you'll only have two body posts between the introduction and conclusion. However, with longer matches, you can take a more in-depth approach to the battle by drawing out the plot, the characters, and setting the stage for your fight. Always keep the post limit in mind when you start a battle. 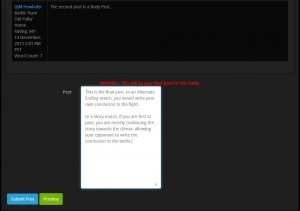 With the first post, you will have the freedom to create your own scenario without feedback from your opponent. Remember that you are limited in what you may do in the first post of a match. By the end of your post, your opponent's character (and yours, for that matter) must be in a condition that allows the fight to continue in a natural manner. That means that killing your opponent outright will result in a disqualification. This also means that putting a character in an impossible-to-overcome situation will be looked at harshly by the judge of the match. For an introduction to the battle, you should introduce the setting, the characters, and the scenario, but remember that it is just the first post. Don't rush the conclusion of the fight just because you are posting first. The best way to end your first post is to leave the fight at a point that is both accessible for your opponent to write from, and provides a certain amount of impact. Continuity between posts, as explained later in the Judging section, plays an important role in ACC combat. The story you're writing must be shared equally between yourself and your opponent. It is a collaborative effort to create a battle. All posts between the first/introductory post and the final posts are known as body posts. The body posts are where the majority of the story is told during a match. This especially comes into play in longer matches, where building off of your opponent's previous posts becomes more important to the overall development of the fight. Before you begin to write a body post, you must carefully read through and consider all previous posts in the battle. This means taking into account everything that has been established in the fight until now—what's happened between the characters, the terrain, your weapons, your armor/clothes, and anything else that would serve the Continuity of the story. Sometimes these details are minor—if part of the venue was damaged or if there are burns on a robe, but sometimes these details are major—wounds suffered by the characters or weapons being damaged/destroyed. By failing to account for the details in previous posts, you will interrupt the flow of the story and receive a lower grade from the judges. Your body post starts from the point where the previous post left off. The idea is to make the transition as seamless as possible. That means your best bet is to keep the same tone of the earlier posts. However, while your opponent's posts will often place a greater emphasis on their own character—describing his or her own thoughts and actions—your posts will change the point of view by following your character. Continue the match from this new point of view to keep the story flowing naturally and adding your own unique ideas to the fight. In the standard format, each writer gets to describe their interpretation of how a fight will conclude. A fight does not need to end in death, but there needs to be a clear and definitive victor—meaning one of the characters is either down, injured beyond continuing the fight, or rendered unconscious. The final post(s) must wrap up the fight between the two characters and offer a satisfying and climactic ending. Both combatants must be able to make use of all previous posts to determine how the story ends. However, keep in mind that the ACC is not judged on whether or not your character survives and wins the fictional duel—it is judged based on your writing ability. This means that it is entirely plausible for you to write your own character as having lost in the fight and still be able to win the match itself. Oftentimes, it is much more realistic for your own character to lose, based on either the circumstances of the fight itself, or a drastic difference in rank. Keep these factors in mind when you begin your final post. Depending on the type of match, the way you handle your final post will be determined by the match type chosen for the battle. In an Alternate Endings match, both combatants will write their own, unique conclusion to the fight based on the last body post written. In our standard 2/2 format, this means that the first poster will write their final post first, based off their opponent's last post. It should be noted that your opponent cannot see your final post once it has been submitted until the battle has been judged. This is a measure taken to prevent writers from accidentally pulling ideas from their opponent's final post. The second poster will write their final post based off their own last post. This means, while the first poster gets to set the stage for the match, the second poster gets an edge in determining how the fight will end. Though the second poster can begin writing his or her final post after the last body post, they will still have to wait until their opponent posts before posting themselves, following the same back and forth format of the fight as usual. With the Singular Ending format, the very last post is the sole conclusion to the fight written by the combatant that posted second. Rather than both writers creating their own version of the battle's finale, they instead tell the story together with the last two posts. In this format, the first poster gets to tell the introduction to the story, while the second poster gets to write the conclusion. There will come times when you are not able to complete a post within the allotted time period of the battle. If you wish to extend the battle so that you are able to complete your post, you may request an Extension. Under the Battle Information heading on your active match, you will see an Extend Battle button next to your time remaining for post. The first Extension Request is automatically approved. However, should you need a further extension still, your request will have to be approved by your Opponent, who may or may not agree to the extension. Should you fail to post within the time period, and an Extension was not taken or approved, your Battle will be closed due to it being Timed Out. A match closed as such will remain closed unless acted upon by a personal emergency. 1. In the ACC, Dark Jedi Brotherhood Wikipedia Articles can be used to expand on the history of a Character and their career in the Brotherhood. This can be done to enhance storytelling and reference times in a characters career/history, ranks, positions, etc. This includes a character history with other members, Mentors or Students, and other "relationships" between characters. 2. Anytime you are going to introduce characters that appear on your Wiki page but do not appear on your Character Sheet, make sure that you properly introduce who they are to the reader. A judge should not have to go to a wiki to first check who the support-characters you mentioned are. Good: A character has a +5 in "Blasters" on their Character Sheet, and their Wikipedia article lists them as "Having won 3 world marksmanship awards". It would make sense, then, to be able to reference it that the character has won marksmanship awards before, even though this fact is not specifically listed on their Character Sheet. Bad: A character grew up on a world that had Hutts on it, so they start speaking Huttese fluently. The Character Sheet, however, does not list Huttese as a learned Language. As a requirement of taking this exam and participating in the ACC, you will have completed your Character Sheet and had it approved by the Voice Staff. This section will cover the basics of how your sheet translates into actual writing in an ACC match. There are four major characteristics of the sheet you must familiarize yourself with when you begin an ACC Match. These are the physical description, Aspects, Skills, and Force Powers of both you AND your opponent. Though your posts will generally be written from your own character’s point of view, you will have to familiarize yourself with your opponent's characters to properly capture their style and nature in a battle. Physical description is one of the most obvious things a writer needs to incorporate into a story, but it is also one of the most overlooked areas in the Brotherhood. Every member with a Character Sheet will define his or her character’s appearance in a few paragraphs, and oftentimes, have an image or two as a basis that can be found on his or her CS or Wiki page. Readers need to be able to identify characters by their physical descriptions, helping them to separate one from the other in an ACC match. This is not done by copying the physical description information word-for-word from a Character Sheet, but by embellishing key characteristics to paint a picture of a character that a reader can visualize. Aspects are key attributes of a character, either written or chosen to describe what makes a character unique. Aspects allow for a quick description of a number of facets or history of a character–from unique general features (which could include background from before the Brotherhood, or some physical trait), to personality features, to combat preferences–that guide or describe the behavior of the character. These aspects make up WHO a character is and is an important part of making sure your writing accurately captured both characters. ACC matches are partly judged based upon realism—part of that is how realistically you portray both your character and your opponent’s based on the information in the Character Sheets. While Aspects define WHO a character is, Skills and Force Powers determine what a character can actually DO. Skills are slightly different from Force Powers in that many Skills are usable untrained at the rating of mediocre, though not as viable as Skills with higher degrees of proficiency. Force Powers, on the other hand, require that at least some points be invested in them. The Character Sheet measures Skills and Force Powers with numbers—on a scale of +0 (Mediocre) to +6 (Sovereign/Grand Master). What these numbers refer to is how much a given character has invested in a particular skill. The ACC, however, is not a numbers game. It is about writing skill, style, storytelling, and knowing how to determine a character's actions based upon his or her Skills and Aspects. If two characters have +3 in their primary lightsaber form, they would, in an empty vacuum, be evenly matched in terms of skill. This is where you then factor in everything else about the character: speed, strength, stamina, tenacity, personality, and the other skills that would factor into how a character would fight. Are they a cautious fighter or a reckless fighter? Do they enjoy combat, or detest it? All of these questions come together to create conflict, which, as we established, is the core of the ACC. Judgment of a battle comes down to how well and how realistically you incorporate the information in the Character Sheets into your writing. To make proper use of the Character Sheet, you must be able to draw from every facet of the characters to write an exceptional depiction of them in battle. Ideally, you will make use of the Skills in combination with a character's Aspects to illustrate their fighting style in a match. Each part of a character sheet should give a complete picture of a character. Moreover, when you are writing someone else's character, the Aspects provided will ensure you do them justice. It is the little details that make the difference between a competent combatant and a winner. By understanding the character details and the numbers involved, you will be able to grasp the nature and style of an ACC post. You must be able to use the Skills and Force Power numbers correctly with the Aspects of the characters and their personalities to decide how a fight will play out in writing. This will help you to determine a character's actions, reactions, dialogue, and even the final outcome of a given situation. Apply this knowledge to write the best post possible. Unlike when writing a story, the ACC requires collaborative writing, which means two (or more) people have to write back and forth to tell the story. In the ACC, this story often revolves around combat between the participants, which can be difficult as each writer will want to give his or her own character an advantage while hampering his or her opponent. Part of how an ACC match is judged is based on how well you are able to write a fair battle that flows logically from post to post. In writing, the Force should always be capitalized. You reference two different things when talking about a force of nature, and the mystical power we call the Force. In combat, don't simply write the name of a Force Power. This leaves little to the imagination, and creates a vagueness to the action you are describing. Try and explain what the Force power would look like to someone who has no idea what the Force is. Bad: "He used Force Pull to bring his weapon back to his hand." Better: "He reached out with the Force and recalled his fallen weapon to his hand"
The key to writing Force usage is to explain the Power’s effect in a way that the reader understands what power you are using without needing to have it bluntly pointed out. Show us, don't tell us. One of the most critical points of a proper ACC match is being able to follow the continuity established in previous posts. When in battle with another member, it is more than likely that your character will be wounded, in pain, and/or exhausted before the battle reaches its climax. The worst thing an ACC writer can do in that situation is ignore what has befallen their character. As was mentioned before, ACC matches are collaborative, which means you will have to deal with anything that happened to your own character in your opponent's posts. Being wounded does not necessarily mean your character is no longer able to act in a battle. It simply means that you, as a writer, must acknowledge the damage. If your character was shot in the leg, he or she will not be jumping around and doing cartwheels in the next post. You have to address the problem—either by calling upon your character's skills (stamina, resolve, etc.) or by using a power (healing, control self, etc.) to diminish the effects of damage. How you handle damage will determine a large portion of your grade in the match. It is hard to resist the idea of making your character some sort of superhero who can shrug off pain and fight to the best of his ability no matter what. But that's not realistic AND it's not very interesting to read. "Godmoding", the practice of making your character invincible in your own writing, is an issue many members of the Brotherhood have when competing in the ACC—and oftentimes results in a dramatic decrease in score. For example, say Harry has been wounded in his opponent's post. He has been stabbed in the right arm and can no longer use it. He is in a lot of pain and his weapon has fallen to the ground. In his post, Harry must REACT to that pain, then attempt to overcome it. Based on Harry’s Character Sheet, a wound would not be enough to make him cower, so he would push forward. He would use his Force Power for Healing to lessen the damage, perhaps utilize the Control Self power to force his body to work despite the damage. It would be written as a struggle, both physical and mental, as he makes himself pick up his fallen weapon and raise it in an unsteady hand. The lightsaber is one of the most iconic weapons in science fiction. It is also one of the most powerful. Per the latest Star Wars Canon information, a lightsaber’s blade is a solid beam of energy that exists within a containment field. The containment field is what gives the lightsaber blade its shape, size, and also prevents the weapon from giving off heat until making contact. This explains how a Jedi could hold a lightsaber in front of their face without giving themselves an unwanted tan. In regards to lightsaber combat and inflicting wounds with the iconic energy-blade, there is a big difference in how sword fights are dramatically paced. In a sword fight, there is typically a single crowning moment where one fighter surpasses the other for the killing blow. In others, there can be a battle of attrition where wounds are inflicted until only one fighter is left standing. This is aided by the fact that a sword hit, bullet wound or even a graze from a blaster can inflict lingering damage of various degrees. In each case, there is a suspension of disbelief that exists to allow you, as a reader, to realistically believe a character could push through that damage and continue a fight. In a lightsaber duel, there is a lingering knowledge that there are no “minor” wounds. The tension builds and swells around the singular notion that when one person messes up, the duel is over. This is the case in the most famous duels in the Star Wars Universe. When Luke gets his hand cut off in his first fight against Darth Vader—the fight is over. When Anakin gets his hand cut off fighting Count Dooku, he is thrown backwards and lays down unconscious on the floor. These are two fitting examples of how while it doesn’t seem like much, losing a hand to a lightsaber in Star Wars is a major, fight ending injury. When someone lands a hit with a lightsaber, if only superficial in nature as seen in The Force Awakens, the most resilient of fighters can keep going. However, the loss of limb is an indisputable "match ending" scenario. True to what we’ve seen in Star Wars duels, a lightsaber has the ability to “ground” Force Lightning. For the purposes of the ACC, a character should have their lightsaber at the ready and facing the opponent head-on. While not taxing, it is an action that would require the character to be focused on the incoming attack, making it less believable in a situation where the Lightning is thrown by surprise. Powers like Precognition can come in handy with this, but are not required. For more information on Lightsabers, see the Lightsaber Forms Guide. Armor provides variable protection from both the environment and potential aggressors. While this is of great benefit, it is not without its own trade-off. With more intensive protections comes greater encumbrance. The wearer must keep in mind this balance as they don armor that meets their specific needs. Attire Items classified to this tier only provide the most superficial of protection. This item merely protects a wearer's modesty and stands against moderate weather conditions. Light Items classified to this tier provide base level protection. This item can withstand glancing cuts and blows, but will buckle against medium to heavy blunt force and direct strikes from bladed weapons. No protection from blasters and slugthrowers. Medium Items classified to this tier provide moderate protection. This item can withstand cuts and blows, but will buckle against heavy blunt force of 2-3 direct strikes from bladed weapons. Glancing hits from blasters and slugthrowers are mitigated. Heavy Items classified to this tier provide top-level protection. This item can withstand cuts and blows, but will buckle under 4-6 repeated attacks. It also protects from small arms such as low-powered blasters and smaller caliber slugthrowers, though no protection from stronger or vehicle-based weaponry. Encumbrance is defined as a point reduction applied to Athletics and Stamina that is considered to be in effect as long as the armor is worn. As standard skills cannot drop below +0, any reduction applied will not move past this value. Lightsaber Resistance is applied only to specific possessions and they will be labelled as such either through an Item Aspect or the description itself. When it comes to protection, the description of the Possession and any Item Aspects present are law. The specifics are left open to the creativity of the writer when it comes to applying these effects. Weapons with improved piercing, such as "Armor-Piercing Ammunition" on a slugthrower, will—in theory—penetrate armor easier than other conventional weapons. Anti-vehicle weaponry would be much the same. Environmental effects are influenced by the base description and Item Aspects as well, affording enclosed systems such as helmets to potentially protect from gas and other hazards. An Alternative Ending ACC match can only be ended in either poster’s final post of the battle. This means that both combatants must ensure that their opponent can continue the match after each body post. Neither combatant can deliver a killing blow to their opponent in the posts before this final post. It also means that severe wounds, that would make it impossible for a combatant to continue the battle, are generally not permitted, or result in a very low grade given to the writer. There are also limits built into the match itself based on any options selected when setting up the battle. Remember to pay attention to these settings because ignoring them will result in a loss, or even a disqualification. If you and your opponent decide on "no Force", then neither of you can make use of your characters' Force Powers. The same can be said for "lightsabers only" or "blasters only" and the other options. Make sure to know the limits imposed by your chosen settings. When fighting in different venues, it is important to incorporate the environment into your match. Part of this includes incorporating characters other than your character and your opponent’s character. Non-Player Characters (NPCs) can add a lot of value to a story, but also prevent challenges. The ACC is about the narrative behind a conflict or duel between two members. With that principle in mind, an NPC is not allowed to take the place of your match character (MC). This means that they cannot become the MC, and cannot be merely a crutch or tool of convenience. For an NPC to be used properly, they need to be organically worked into the story in a way that enhances, but does not detract from the spirit of a duel between two members. What this means is that an NPC (one of your own or just bystanders in the venue you're assigned to) can be used in the manner of an environmental feature. They must have minimal impact, but can still be a character resource (such as dropping off at a location or picking up from a venue at the end of the fight). They do not do the fighting for the MC. The phrase 'deus ex NPC' comes up from time to time. This is to be avoided. An example of this would be an NPC suddenly appearing out of nowhere and blocking the final attack, saving a character from their fight and being 'forced' into the situation. It bails the character out of the natural flow of events and directly interferes with the outcome of the duel. For some competitions or select Scenario Hall venues, an NPC may be used as a key set-up factor, and will always have a character sheet linked for reference. NPCs cannot be listed as weapons for a match. NPCs can be included in an ACC match, as long as they are minimal actors that add flavor to the conflict and story without interfering as primary combatants or having a match deciding impact. Other characters in the Brotherhood may make cameos, similar to an NPC, but are prohibited from being involved in the match. Droids are available as a form of weapon in the ACC through the Loadout system. If a Droid is to be used, it must have all available Item Aspects selected to fully quantify its abilities and portrayal. When encountering a Droid in a match, it is good to remember that story trumps convenience. That is to say, if faced with a combat specification Droid in your first post, it would be bad form to completely trash it and cast it off. This is similar in the approach to weapons or grievous injuries. Destroying a weapon, or crippling an opponent, would not occur in the first post and will ultimately throw off the pacing of the match. That said, Droids do not have plot armor and can be readily destroyed later in a match if the scenario fits. Much like when dealing with a human opponent, there is no hard number regarding how much damage a Droid can take. It should make sense within the constraints of the match and established through writing (based on the Droid's Item Aspects) what their durability is like. As a Droid has no Loadout of its own, any weapons it uses are shared from the owner's active Loadout for the match. Important Note: The use of a Droid in the ACC without a complete set of Item Aspects will result in a mark against Realism the same as using a non-listed weapon. Grading will be broken down into FOUR (4) base criteria, each of which must be addressed by the judge: Syntax, Story, Realism, Continuity (SSRC). Each of these base criteria will be scored on a scale of one to five with each category having different weighting, based upon the ACC Grading Rubric. Within each category, there are both "major" and "minor" detractors. While both major and minor detractors should look to be avoided, major detractors will cause your score to drop significantly, while minor detractors typically need to accumulate or add up to have a larger impact. Minor detractors, beyond adding up, can also be the determining factor in near-tie scores or otherwise close matches. In certain rare circumstances, some major detractors may be waived based on competitions and their specific details. The basis of any good writing is syntax. If a judge can’t make sense of what he or she is reading, the rest of the post can easily fall apart. Spelling, grammar, punctuation, formatting, and post length all play a role in syntax. While the ACC can be quite technical, the creative use of language to tell your story is also important. Criteria will be held to the English language, with flexibility in regards to the differentiation between words like "armor" and "armour". The more egregious the errors in syntax, and the more they subtract from the readability of the post, the lower the score in syntax. Posts Under 250 Words Minimum (Make sure to go a bit over 250 words in your post, as some word processors count words differently). Use of first or second person writing (Please only write in third person past tense). When writing dialogue, especially in combat, it is important to be clear with who is saying what and to use the proper format. Dialogue can either be self-contained, or modified. Self contained dialogue has a definitive stopping point, where the next sentence is not tied directly to how the line of dialogue is delivered. Example: “If you don’t proofread your ACC posts, you’re going to have a bad time.” Wally moved on to the next topic on his checklist. When you are attempting to modify or assign inflection to the dialogue, you end with a comma, and then follow the end-quotation as if you were finishing a regular sentence. Example: “If you don’t write dialogue properly, I will send you to the front lines,” he said with a sigh. When referring to someone by name, a comma is used to show the natural pause or intake of breath that adds pacing to the cadence of your dialogue. Combat Master Pro Tip: The best way to proof your own dialogue is to read it out loud. You will often hear and catch things you missed in your head. Since it has come up before, here is the ACC's policy on Ellipsis. Ellipsis belong in narrative fiction. The use of Ellipsis must be consistent throughout the post. Inconsistency is what will lead towards a Syntax detractor because it detracts from the flow of reading. An ellipsis is a set of three periods ( . . . ) indicating an omission. In narrative writing an ellipsis can also indicate hesitation, though in this case the punctuation is more accurately described as suspension points. Ellipsis can be used to trail dialogue or a thought off, or slowly bring you in to a dialogue or line of thought. This category measures how enjoyable and entertaining the posts were to read. While the ACC is about conflict and ultimately combat, it is also about story, creativity, and entertaining writing. A well-written post will not only be technically sound, but also have a story that flows, an engaging conflict, an emotional investment in the characters involved, and the unique approaches taken to combat. When writing engaging combat or action stories, details matter. Never take for granted that a writer knows what “stance” or “style” means just because you do and are telling the reader about it. It is your job, as the writer, to show us what you mean by illustrating the action. When you say: “He used his Soresu to defend against the other fighter’s Ataru” you are expecting the reader to know that Soresu is a defensive form and Ataru is wildly focused on offense. This is lazy writing and does not help make the action engaging for the reader. Instead, you need to show the reader what that means. You show the Soresu user batting away the Ataru user's wild and kinetic strikes. You show the Ataru user jumping and turning and twisting and striking from odd angles. You show the Soresu user expertly setting their feet and deflecting each attack with tight-coils and turns of their saber. Show the action and paint a picture for the reader. Don’t just sit back and tell them about it like it’s a series of bullet points. Harry’s right foot slid backward as he staggered his stance and chambered his quarterstaff under his right arm. He dipped into a crouch to minimize his target area, knowing that his height could actually work against him against someone as skilled as the Combat Trainer. Harry dropped into a quarterstaff fighter stance. While judges will have a variance of tolerance for this critique, it is a very common comment made in ACC matches. Realism measures a writer’s ability to properly represent the setting and the Character Sheets of both members involved in the conflict. Other than the major detractor here of excessive profanity not appropriate for the Star Wars universe, the greatest penalties involve things akin to “godmoding”, in which a member does not respect either his or her own limitations or that of his or her opponent. An excellent post goes beyond simply accounting for realistic levels of power, but also incorporates the unique elements of both characters, including Feats and Aspects. Godmoding—the act of making your own character invincible or otherwise more powerful than he or she should realistically be. Continuity refers to the flow from one post to the next. It reflects how clear it is that the writer is utilizing his or her opponent’s posts in order to write about conflict between characters. Posts with good continuity clearly reflects the writing of an opponent, and is cohesive from post to post. Writing your posts as if your opponent’s posts didn’t happen at all. Ignoring a wound or event established in an opponent's previous post. Procuring a weapon on your person not established at the beginning of the battle through the Weapons selection or Venue description. Every match in the ACC is graded by a trained staff of Judges. These Judges all utilize the same criteria and same grading guidelines. A Judge will use the Grading Rubric, in combination with the combatants’ Character Sheets, to create a final assessment of the battle. In the event of a tie in score, the Judge of the battle has the discretion to determine the winner based on a judgment call on which combatant wrote the best posts overall. Judges are the primary staff of the ACC and are chosen by the Combat Master. The Combat Master may also appoint a Deputy Combat Master to assist him or her in overseeing the day-to-day operations of the ACC. The Combat Master reports directly to the Voice of the Brotherhood. For the categories of Syntax and Story, there is no such thing as a tie. These are the kinds of subjects that while both members may meet the requirements of a 4 on the rubric, they had clear differences in how many issues there were. In those cases, when the rubric matches, the judge is to select a member to be awarded Advantage. This adds partial points to the score and moves away from ties. Often, a judge will employ the help of other judges and even the Combat Master to review and help them decide where the Advantage should fall, though this is more prevalent to Story than Syntax. The verdicts of a Judge are final, though participants are encouraged to seek out Judges should they have any questions on the rulings provided. Should a participant in the ACC feel that his or her post has been egregiously misjudged (such as missing a major detractor), he or she may request an appeal on a verdict to the Combat Master. The Combat Master will not issue a re-grade of the battle, but will look over the battle and at the judge’s notes and either uphold the judgment, or in the event of an egregious error on the part of the judge, overturn the verdict. This page was last modified on 11 January 2019, at 17:14.